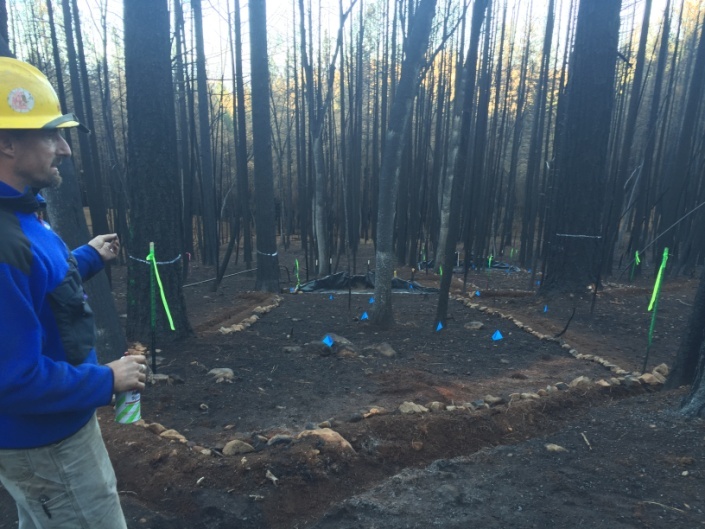 A Pepperwood Fire Mitigation and Forest Health Initiative update. When Michael and Sophia and I finally reached the severe burn zone, it was kind of like stepping in to the cartoon world of Tim Burton’s Nightmare Before Christmas, with slender ebony black branchless trunks clawing at the sky. 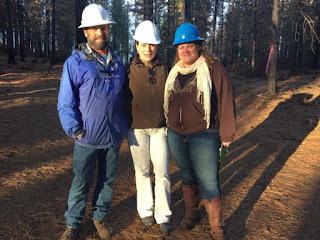 The foresters tried to break us in easy on this Boggs State Research Forest tour, including Nick Kent of CalFire and Fred Euphrat who is an instructor at Santa Rosa Jr. College and currently advising Pepperwood on our forest management planning process. We met at the Boggs Mountain CalFire forest station, which had been an island of firefighting activity during the onset of the Valley Fire less than two months ago, before the guys who worked there put up their “white flags” and had to get helicoptered out. The station itself survived and was in a zone of relatively low burn severity. While some of the trees showed sign of char from the flames, the ground itself was covered with recently dropped pine needles which draped a soft looking sepia carpet over whatever scorched soils lay beneath. At the station they showed us a map of the burn zone marked in pink to dark reds, with the darker the red showing increasingly greater burn intensity. 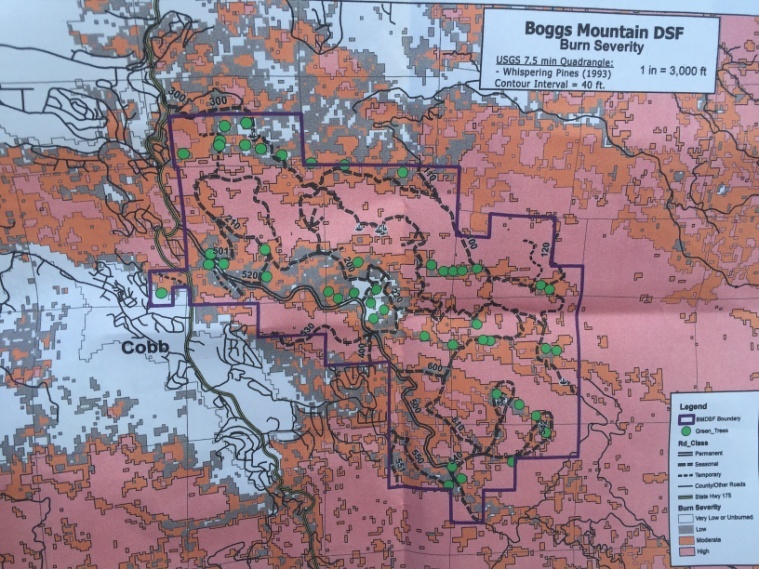 Green dots showed the survivors, living trees the foresters hoped would provide some of the seed needed for forest regeneration. But right now the urgency is on identifying the dead trees, and getting them out of the forest for a couple of reasons—to reduce future fuel loads, to make way for new plantings, and perhaps even to help fund restoration. They do leave 5% of the dead trees behind for habitat, with dead wood known as excellent habitat for cavity-nesting birds and other critters. example of healthy indicators despite scorched bark. The way the foresters can tell whether a tree is alive or dead is by taking an axe to its base and taking off about 1 inch or more of the bark in order to expose the cambium* underneath. The cambium seemed rather akin to our own fatty layer, lying just beneath the skin of the tree, and containing cells that are in charge of growth (see the more technical definition below). We learned that if it is white and firm that’s an indicator of life, but if it’s gooey and caramel colored, the tree is likely a goner. So this has been a big focus of the immediate post-fire efforts on the state forest, to identify live and dead trees in order to cull out the dead. Don Lindsay of California’s Geologic Survey showed us the water quality/sediment runoff study sites that are being installed at multiple locations to measure how much soil erodes this winter off of the forest floor. This is really important given we are in an El Niño season that could bring heavy rains! Will the more severely burned areas shed more soil than the less severely burned areas? Lindsay’s study (in partnership with university researchers) will create controlled study sites where literally all of the sediment coming out of a small drainage (1-2 acres) uphill will be captured and measured. They will also measure the amount of incoming rain and water coming off the sites using a rain gauge plus a small dam and water depth measurement setup. (See photo below). It’s exciting to know they are collecting this critical data and it’s also clearly a lot of work. Don has been hustling to get the sediment traps installed before the onset of the rainy season. Eerie shape left where a living tree stump used to be. When they finally took us into the severely burned area, it was like stepping into a charcoal landscape. The trees were shiny and metallic, with their bark looking in some ways more like stone then wood. The stones that were burned were shedding their fried outer layers (called spalling**). There were shadows of branches where all that was left was oxidized rust colored minerals streaked across the black earth. 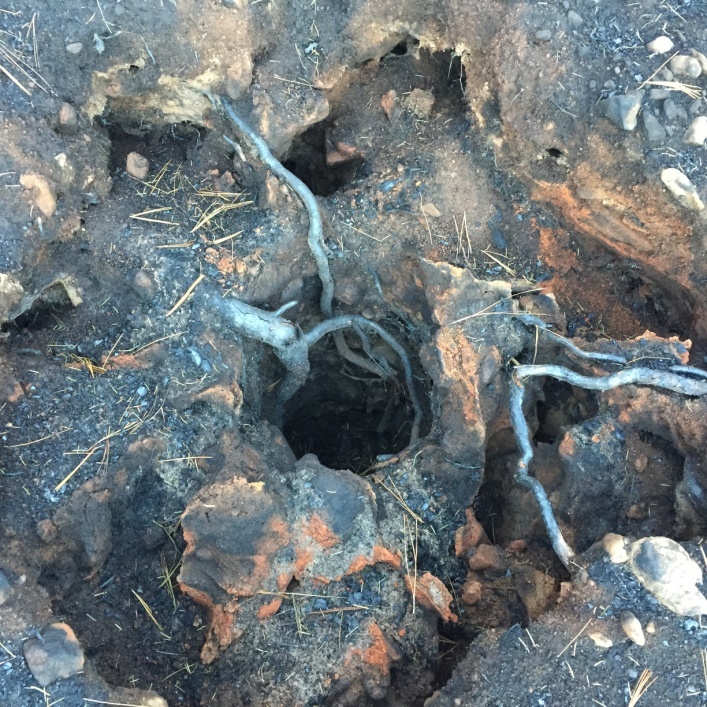 We found more than one reverse tree stump, where the earth was essentially sculpted by the negative space of a tree vaporized by the heat (see photo below). Where the soils have experienced great heat, often at the intersection of rock or root, Fred showed us how hydrophobic*** (or water repellent) the soils were by pouring water out from a drinking bottle to show us how it pooled up and refused to sink in. This means even though the soils are extremely stressed by drought, one of the lasting effects of the fire will be to cause more runoff than normal for at least this winter. Someone in our group started to observe that beetle activity was already evident on the burned trees, including tiny little piercings on the bark surface and some kind of extruded waste collecting at the bottom of the tree which was oddly a light pink-orange color. 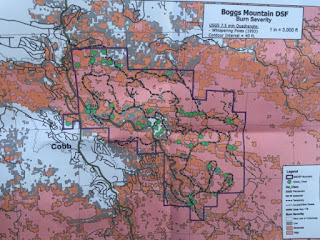 With the threat of bug infestations helping to take out what’s left, starting next spring the foresters will focus intently on planting new trees, and apparently a range of planting techniques will be designed and tested at Boggs Mountain State Forest. On the way out we saw many signs of miraculous life coming back on its own: a bracken fern that had pushed up through the charcoal soils, and this fresh oak shoot coming off a fried stump. I thank Nick and Fred for hosting us and I look forward to visiting again next spring to help track the recovery of the site! *The vascular cambium is a plant tissue located between the xylem and the phloem in the stem and root of a vascular plant, and is the source of both the secondary xylem growth (inwards, towards the pith) and the secondary phloem growth (outwards to the bark). It is a cylinder of unspecialized meristem cells that divide to give new cells which then specialize to form secondary vascular tissues. ** Spall are flakes of a material that are broken off a larger solid body and can be produced by a variety of mechanisms. Spalling and spallation both describe the process of surface failure in which spall is shed. *** Hydrophobic is repelling, tending not to combine with, or incapable of dissolving in water. On October 3, 2015, Pepperwood launched its Fire Mitigation and Forest Health Initiative at its anniversary celebration and first ever fundraiser thanks to an outpouring of support by the community. The objective of this initiative is to integrate multiple threads of Pepperwood’s applied science and management activities into one unified approach to forest health. Our goal is to demonstrate best practices on the preserve and to leverage Pepperwood’s role in research, outreach, collaborations, and technical advising to expand these throughout our region. One of the many beautiful oak woodlands found at Pepperwood. Here are just a few of the exciting developments kicked off since our launch. 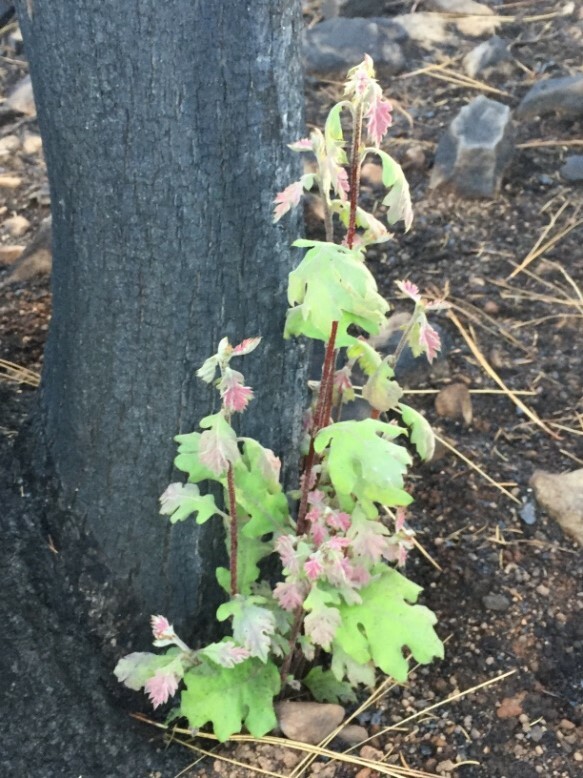 Pepperwood’s Mayacamas Forum to host spring convening on fire mitigation and forest health in partnership with Bureau of Land Management (BLM). We are in the planning stages of a workshop with BLM to bring together our researchers and experts to share and advance the multiple threads of this initiative. Pepperwood engaged in White House Office of Science and Technology Policy’s Climate Resilience Project and presenting at their hosted session at the American Geophysical Union (AGU)'s Fall Meeting. Pepperwood’s Dr. Lisa Micheli has been invited to present on December 14th in the White House’s session on Linking Climate Resources for Community Resilience where she will present her Climate Ready work on links between drought and fire. Pepperwood raises awareness of connections between fire and drought via Climate Ready North Bay. In its role as the science lead on the California Coastal Conservancy-funded Climate Ready North Bay vulnerability assessment for Marin, Sonoma, Mendocino, and Napa counties, Pepperwood is applying a statewide model that estimates the increase in fire risk associated with climate change for the benefit of our regional county water, parks, and open space districts long-term planning. Pepperwood selected to advise the North Coast Resource Partnership (NCRP) on climate, hydrology, fire and forest health. The NCRP, which serves coastal counties from Sonoma to the Oregon border, has chosen Pepperwood and it’s USGS Terrestrial Biodiversity Climate Change Collaborative (TBC3) partners to extend our Climate Ready North Bay approach throughout their region, thanks to funding from the Regional Growth Council, to support long-term sustainability planning. Pepperwood completes this year’s installment of fuels reduction on the preserve. A significant portion of Pepperwood’s annual stewardship budget is focused on removing thickets of young trees that in previous times would have been cleared via native peoples’ prescribed burns or natural wildfires. These young fir saplings create a dangerous level of fuel loading. This fall Pepperwood cleared over 12 more acres of accumulated fuels in concert with our partners at Great Tree Tenders and our dedicated volunteers. Pepperwood has partnered with CalFire to develop a five year plan for comprehensive fuel reductions. 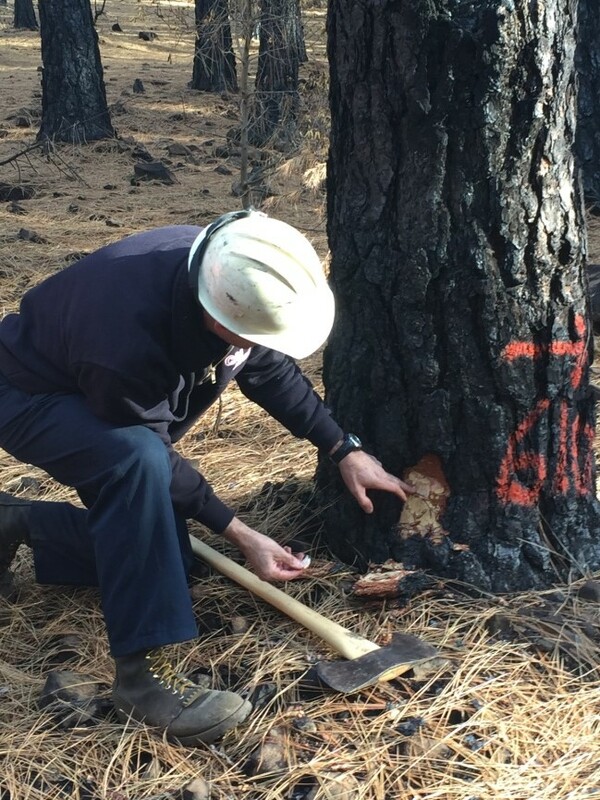 We will work directly with CalFire experts to develop a diverse array of prescriptions aimed at reducing accumulated fuels in the forest understory across the entire preserve. By making this a joint project with California’s lead fire management agency, this planning process will entail securing the permits and clearances needed to move forward with a more comprehensive, long-term approach. Native American advisor joins Pepperwood’s adaptive forest management team. Thanks to the generosity of the Christensen Fund, Pepperwood has been able to officially add our Native American cultural advisor, Clint McKay, to our adaptive management team. We have already gained a valuable long-term perspective on our landscape thanks to Clint’s generosity, and we’re only at the beginning of this process. Pepperwood awarded California Forest Improvement Program grant to develop adaptive forest management plan. Pepperwood was successful in securing a grant to hire a professional forester to advise us on all aspects of long-term management of our forest resources. We are working with Fred Euphrat, Registered Forester, who also serves as the Professor of Forestry for Santa Rosa Junior College. Santa Rosa Junior College students are learning forestry at Pepperwood. Our partnership with SRJC’s Forestry Professor has also created a wonderful opportunity for SRJC students to gain valuable career experienced by assisting in Pepperwood’s forest inventory, and in the process, further strengthen Pepperwood’s long-term partnership with SRJC. We hope this can become an annual learning opportunity for our local natural resource management students. Pepperwood advancing forest and fire research with UC Berkeley. In addition to our now multi-year forest ecology monitoring partnership with UC Berkeley’s Ackerly lab (Department of Integrative Biology), Pepperwood has a new partnership with Professor Scott Stephens’ Wildland Fire Science lab (Department of Environmental Science, Policy and Management). 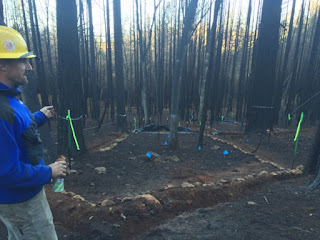 We are exploring an experimental design and monitoring plan for small prescribed fire test plots at Pepperwood perhaps as soon as next summer or fall. With your help, we have already made great strides in launching our Fire Mitigation and Forest Health Initiative. Thank you so much for your support! Stay tuned to our monthly e-newsletter and Pepperwood’s Field Notes blog for future updates. Click here if you want to check out Lisa’s latest blog piece on visiting the Valley Fire burn zone. Practicing with binoculars before heading out. Every December, Pepperwood, Safari West, and the Petrified Forest all come together to host the Mayacamas Christmas Bird Count For Kids. The bird count involves going out to one of the three properties and counting and identifying all of the bird species we see, then uploading the information to an online database. So why do we go out and count all the birds we see? It’s because bird populations are changing in response to habitat loss and climate change. By counting the number of birds and the species in a given area, we give scientists data to track bird populations and see what’s going on—whether there’s trouble coming, if a species is rebounding, if territories are changing, etc. Getting a closer look through a spotting scope. Everyone who wants to participate in the bird count gathers each year at one of the aforementioned properties—this year it was Pepperwood. Several expert birders taught everyone how to use binoculars and bird guides, then divided everyone into three groups. An expert or two was on every team to aid in correct identification. The goal of the day was to find the most birds, but we also wanted accuracy. One team wandered twisty trails of Pepperwood, another searched the wilds of Safari West, and my team explored the woody Petrified Forest. In my group we went through several biomes, watching all the time for movement in the trees, bushes and grass, and listening for calls that might show where a bird was. One person in the group was designated as the counter—they tallied all the species and number of birds per species that we spotted. birder, helps confirm bird identification. Photo © Sandi Funke. After everyone was done gathering data, we all returned to Pepperwood where we turned in the data and the experts compiled it into one single Excel page. In the end, there was a total of 54 species and 928 birds counted. My favorite part was that at the end we got to add our data to the collection of hundreds of bird counts all happening at the same time on ebird.org. There were people all around the world participating, and we got to see the data of our day added to the ever growing pool of information. Scientists are now using the information we collected to study migration and population changes in the species we counted. Join us for the next Mayacamas Christmas Bird Count for Kids on Saturday, January 16, 2016! Click here to sign up or learn more.